Review: An American with a Japanese upbringing, Chris Kenner (Dolph Lundgren) is a police officer assigned to the Little Tokyo section of Los Angeles. Kenner is partnered with Johnny Murata (Brandon Lee), a Japanese-American who isn't in touch with his roots. 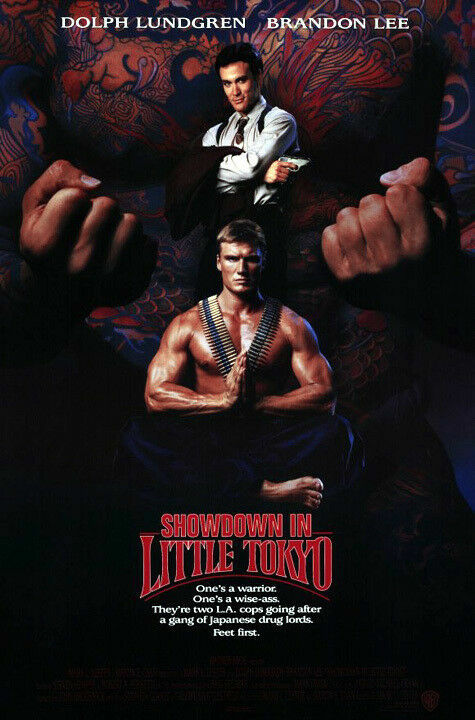 Despite their differences, both men excel at martial arts, and utilize their formidable skills when they go up against Yoshida (Cary-Hiroyuki Tagawa), a vicious yakuza drug dealer with ties to Kenner's past. Showdown in Little Tokyo is a roller coaster of absurdities. I will file this under the good bad movie category. This movie deserves some credit in that it's a fast-paced, entertaining action flick. Fans of Dolph Lundgren will surely enjoy his character and all of the dramatic shootouts and martial arts scenes that ensue. Having never seen any of Brandon Lee's work, I was pleasantly surprised by how funny he was, and I thought he had a good rapport with Lundgren as well. This movie might also have some of the most absurd dialogue and silly quotes I've ever experienced in a film. I laughed quite hard throughout, but I'm not sure if the jokes were funny or if I was truly bewildered that these lines were actually being delivered. I think a lot of people would watch this film, and be completely appalled or disinterested due to some of the subject matter. This film was surprisingly vulgar, and after some mild research it appears that it almost received an NC-17 rating, which is clear given some of the scene content. I thought it was wildly entertaining, silly, and over-the-top, while also demonstrating some re-watch value. However, I must implore you to watch this at you're own peril, because I can see a large majority of folks not liking this film. If you're someone who gets a kick out of movies that are action-packed and brimming with crazy one liners, then this may be right up your alley. Fun Fact: All of the swords used in the film were replicas, with the exception of the one used by Dolph Lundgren's character when he slices through bundles of bamboo: this was an authentic samurai sword.